Congratulations and Thanks – Another Great Show! I love all our performances but yesterday’s was even more special for me. I’ve been with Ah-Lan Dance since 2008 and it’s been wonderful to see the performances and dancers grow. When I first joined Ah-Lan Dance there were a few dancers who were just at the beginning of their studies of Chinese dance. Performances were wonderful, but we were a small studio, so Ah-Lan would invite outside groups to share the stage with us. It’s amazing what we’ve all achieved in a few short years. 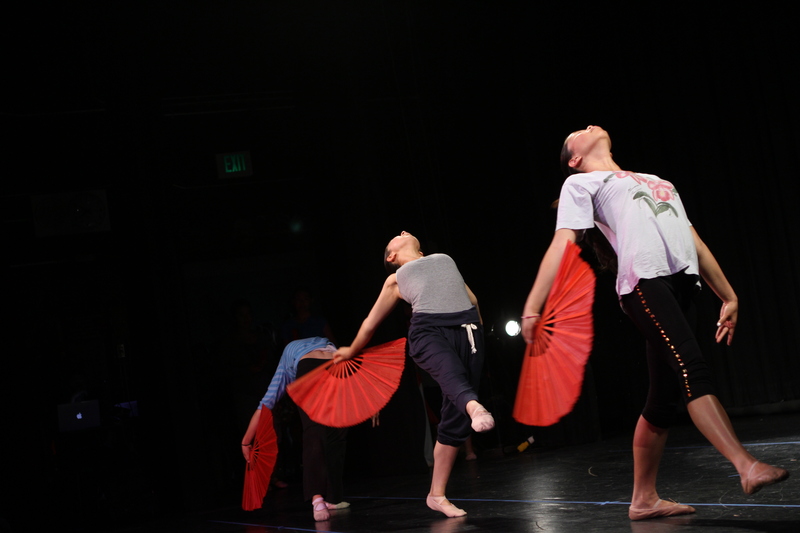 The performances are full of Ah-Lan Dance pieces and the dancers have truly grown into their own. The dancers now get to show off: shen yun (Chinese dance technique), wugong (Chinese acrobatics), ballet, modern dance, and zumba! Dance performances are by nature ephemeral. Years of technique classes and months of rehearsal have their one moment on stage. But dance performances also spin magic that stays with us in the days and weeks after the show. Each and every one was wonderful today, reaching new heights. If you felt something special as a performer or as an audience member join me in sharing you favorite moment, dance, or feeling below (using the comments function). Yesterday’s An-Lan Studio recital at Albany High was outstanding and amazing performance. 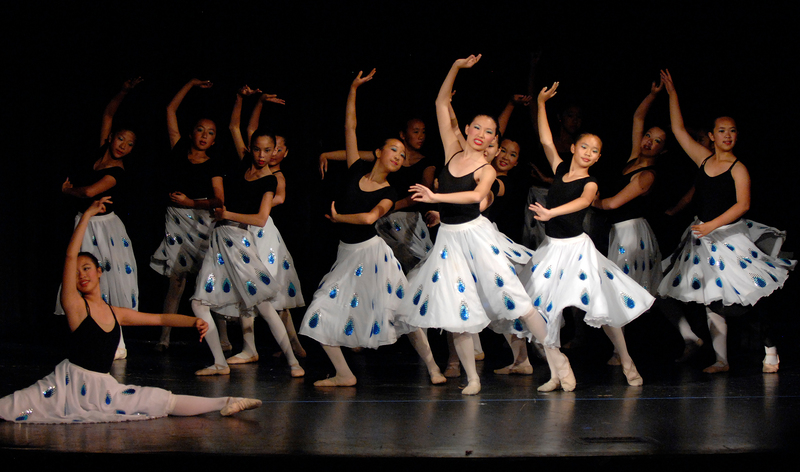 All the dancers were performing with well-trained and professional level. Their costumes and outfits looked perfect in their dance roles. And the young singer (I can’t remember her name) sang Chinese songs so beautiful that I felt she must be Song Zuying(宋祖英）。All the performance: shenyun, wugong, zumba, adult dance and etc. were so impressive that I couldn’t wait to watch next performance called MuLan as Tom introduced on the stage yesterday. An-Lan, you have done such a good job. Thank you for your hard work and lots of new and creative ideas in yesterday’s recital and the future performance. You’re not just an excellent teacher but also a great artist who has brought us such fantastic Chinese music, dance and culture through all the dancers performing different kinds of art work. Yesterday when I saw Rebecca’s smiling face in Shenyun, I couldn’t believe my eyes. I want to say that you must have magic power. Thank you very much. I like the 小背篓 “Bamboo Baby Backpack” best, especially the singer, Jasmine Yang. I am curious if dancers understand what the song means. One thing I like about Ah-Lan dance is that my kids learn Chinese culture there with fun. Even my 3 year old knows the melody of 茉莉花 (a famous Chinese song “Jasmine Flowers”)! I bet Rebecca will remember you when she is 40 years old. Add your own thoughts using the comments section below! 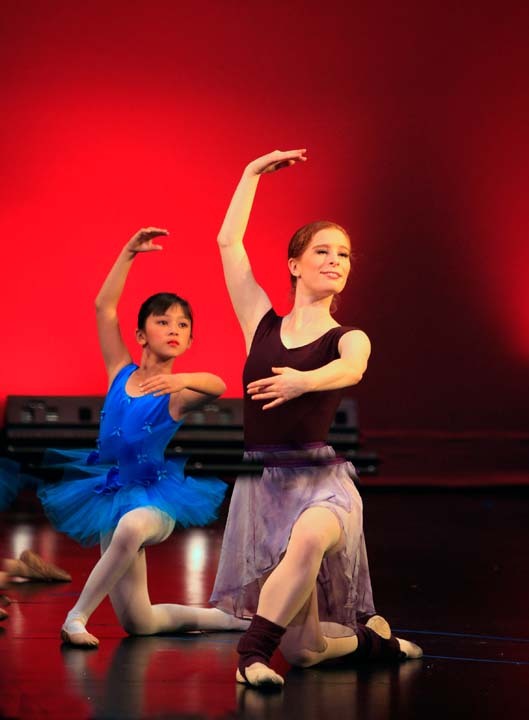 This summer we will have open classes for kids and adults in Ballet, Zumba and Ballroom Dance. See the Summer Schedule. 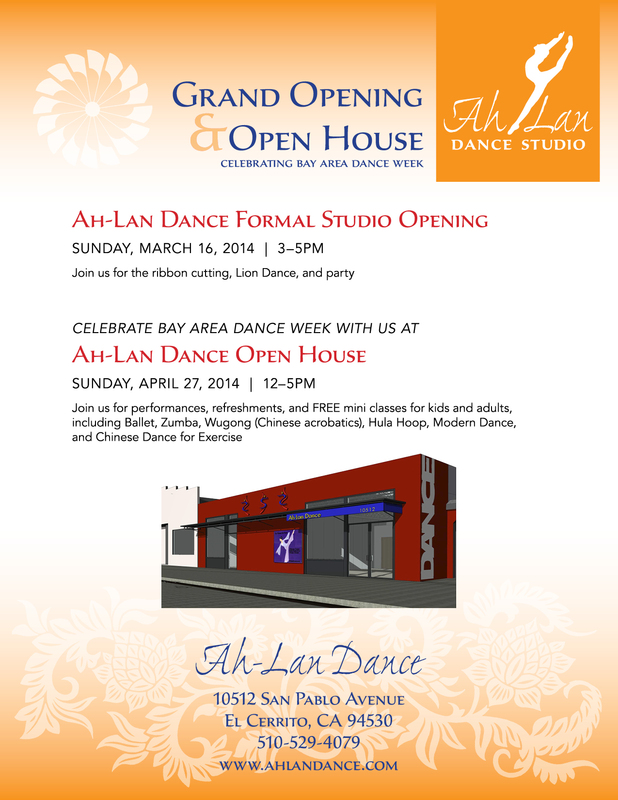 As part of Bay Area dance week Ah-Lan dance is hosting an open house that will feature free dance and exercise classes for kids, teens, and adults from 1 to 5:30pm. There will be yoga, hula-hoop, ballet, Zumba, Chinese dance, modern dance, U-Jam Fitness Dance, and ballroom dance classes. There will be a performance around 1:20 to 1:50 featuring a few popular pieces as well as a premier. Find the schedule for the classes and performance here. You’re Invited: Grand Opening and Open House! Come join us celebrate our new studio with this pair of fantastic events! 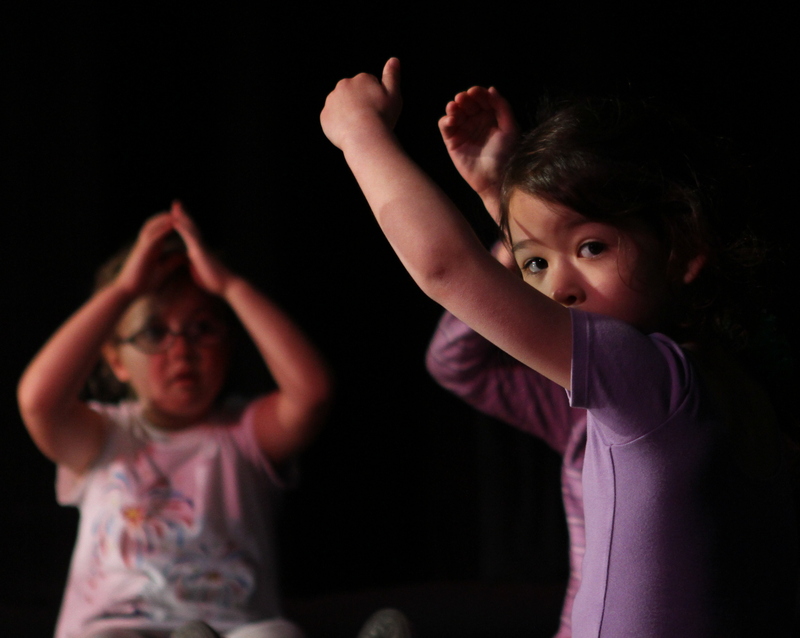 Ah-Lan Dance is now offering drop-in fitness classes for children and adults throughout the week! Just come when you can and take these classes when they fit into your schedule. No memberships needed! Our thanks to Slimgim Designs for creating the new Ah-Lan Dance logo. It really embodies the spirit and joy of dance! It has already come to represent Ah-lan Dance. It welcomes and inspires everyone every time they enter the new studio and it graced the back of the dancers as they performed Zumba at the San Francisco Library Chinese New Year Performance. Being so prominent it was important, that it really represented us and captured the spirit of dance. It came as no surprise that Slimgim Designs could embody our essence so well, since it is owned by our very own ballet teacher, Kari Gim.